How resilient are the SunGrow Hanging Glass Terrariums? Handcrafted with reliable borosilicate glass, the sturdy hanging orbs are incredibly heat-resistant and able to withstand temperatures from -4° to 302° Fahrenheit (-20° to 150° Celsius). This means that these beautiful decorative terrariums are perfect for frigid cold climates or a burning hot desert habitat. Keep in mind that these hanging terrariums are still glass and may crack or break if dropped directly onto a hard surface, so it is important to use caution while handling them. What types of plants grow in these spherical orbs? At a size of 3.45" (8.75cm) tall with a 3.11" (8cm) diameter and 1.81" (4.6cm) glass opening, the transparent glass globes from SunGrow is perfect for low maintenance plants such as succulents, miniature shrubs, small ferns, grasses and creepers. Particularly great inside the hanging terrariums are very easy to care for bromeliads or tillandsia air plants. The attractive hanging glass terrariums act as mini greenhouses by collecting the water vapor released by plants and soils onto their interior walls. The water then trickles down into the soil providing the plants with the hydration and nutrients that they need. Practically a self-nourishing habitat, your hanging glass terrarium may require no maintenance or possibly an additional watering every 3-6 weeks depending on the plants you have inside. Can I use the glass balls for other projects? The transparency and spherical shape of these glass orbs make them an excellent addition to many creative DIY projects. Think beyond just plants and add colorful pebbles and flowers to create a mini fairy garden or seashells and potpourri for unique table centerpieces at a party. As a handmade, tranquil hanging decor (for both indoor and outdoor areas), the spherical orbs make original, thoughtful gifts for friends or relatives. 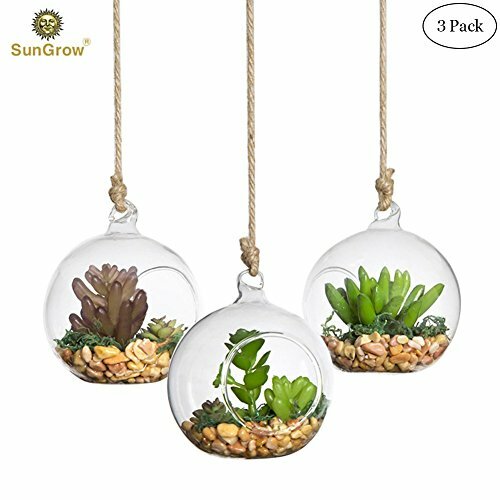 ✔ YOUR IMAGINATION BECOMES INSPIRATION FOR FELLOW GARDENERS --- Get your creative juices flowing with these 3 empty glass globes by SunGrow. You can create the perfect tiny garden scene in your home or office with this heat-resilient orb. Add bromeliads or tillandsia air plants in them and hang in to your kitchen, living room or bedroom and be a source of inspiration to other hobbyists. ✔ MINIMAL MAINTENANCE SIMULATES A MINI GREENHOUSE --- These glass terrariums acts like little greenhouses and require minimal maintenance. Simple to use with the hanging loop is attached. Inside the glass ball, the humidity increases, which many plants thrive on, and allows the air inside the ball to recycle water and its own organic matter. ✔ REFRESHING AND PURIFYING ATMOSPHERE--- Purify and freshen the atmosphere in your home by adding some beautiful air plants belonging to Tillandsia, Bromeliad family or colorful flowers to your terrarium. Add tranquility and nature to your home by adding plants to these glass orbs. The DIY hanging garden will provide you with a relaxing atmosphere. ✔ HANDMADE HEAT RESISTANT GLASS--- Even if you live in a frigid climate or the boiling hot desert, these SunGrow products are extremely suitable for you. These handmade glass balls are heat resistant and can withstand temperatures from minus 4 to 302 Fahrenheit. ✔ PERFECT GIFT IDEA--- This set of three glass terrariums will make an original and thoughtful gift for a friend, relative or colleague. They will enjoy the DIY aspect of growing their very own indoor garden! If you have any questions about this product by SunGrow, contact us by completing and submitting the form below. If you are looking for a specif part number, please include it with your message.